What is it about Mars that so completely captures our imagination? Humans have long been fascinated with the possibility of life from worlds beyond our own, whether we greet it with the horror and dread of HP Lovecraft’s work at the turn of the 20th century or the boundless optimism and brotherhood of Star Trek in the 1960s. We’ve always looked to the stars and wondered what might be out there; as it turns out, the tantalizing secrets of our closest neighbor’s ancient past hold a genuine possibility for life on another world. The first close up images of Mars came to our world in 1969, a mere three years after Gene Roddenberry’s original Star Trek filled pop culture with the hope for a future, of brave new worlds and friendly aliens who would be our brothers in the exploration of the cosmos. There’s often been debate over whether or not Mars could support life, thanks to its polar ice caps and ample evidence that water once flowed on the surface. But that was all speculation: the first real evidence wouldn’t emerge until the new millennium. In 2010, a college student named Lujendra Ojha noticed something odd in the images sent back by the Mars Recon Orbiter: long, dark streaks, hundreds of yards long, running down the sides of Mars’ many rocky mountains. These streaks weren’t shadows, or discolored spots in the rock: they appeared, grew, and disappeared with the changing of the seasons, earning the name “recurring slope lineae” from the scientists who studied Mars. Many people theorized that those streaks could indicate flowing water, and just this year, in September of 2015, the theory was confirmed. The Mars rovers analyzed the ground those streaks flowed over, and found hydrated salts: tiny particles of mineral salt…with water molecules trapped inside their crystalline structure. NASA announced this new discovery to an explosion of excitement: it’s the best evidence yet that our red, rocky neighbor could indeed support life. This discovery comes at a time when another movie stands poised to capture our imagination with the possibilities of exploration: The Martian, starring Matt Damon. Ridley Scott has taken us to space before, with his famous Alien movies and the more recent Prometheus, but The Martian’s message seems to be a perfect complement for the excitement surrounding NASA’s discovery. The Martian has been hailed as a movie that can “save the world.” It’s a story with darkness and horror, the trials of an astronaut stranded on Mars with no rescue imminent…but it’s also the story of survival, of human ingenuity and endurance, and power of science to save lives and change the world. As the discovery of water on Mars renews interest in a manned mission to the red planet, The Martian and its power to inspire couldn’t come at a better time. 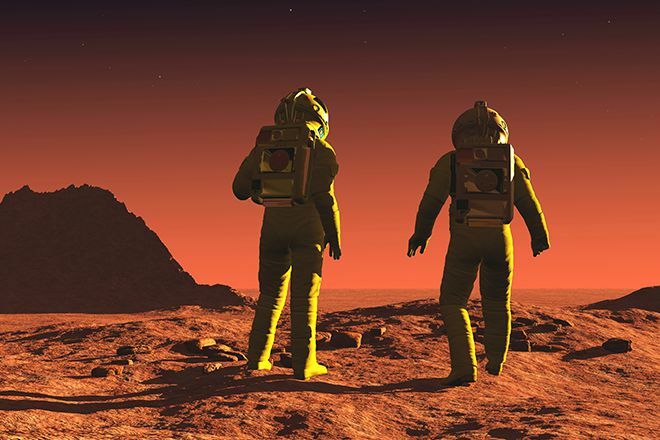 Things could go wrong, The Martian says. They could go really, really wrong. But we can handle it. We’re the human race, and we’re never more powerful than when we have new things to learn and new worlds to explore.